In an increasingly connected world characterized by the exponential growth of the Internet and e-commerce, it is reasonable as a company to wonder whether or not to engage in traditional print marketing. Online marketing has been booming over the last decade, gaining market share on print marketing every single year (source). Many people are keen to point out the shortcomings of traditional print media over online marketing media, both in terms of content and delivery. Unfortunately, these people forget that there are actually also shortcomings to online marketing media over traditional print media. As a rule of thumb, online marketing is very efficient in measuring results and ROI (return on investment) fast, while print marketing generally requires to measure ROI over a longer time period. This is because they are fundamentally different in approach and goals. Print marketing is a top-of-funnel medium, that is extremely valuable in establishing brand awareness and worthiness, as well as credibility in the marketplace. 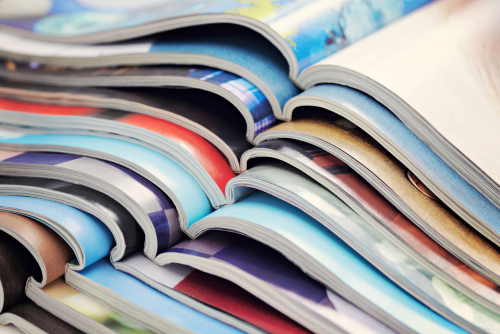 The main advantage of print marketing is that it can be aimed at quite specific audiences with specific interests and preferences (source). Proponents of online marketing will eagerly point out that online ads on Google or Facebook offer an infinity of targeting and retargeting possibilities, however this targeting is most of the time different in nature. While online marketing allows behavioral targeting of customers (based on their previous online behavior: the sites they visit, what they search for on Google…), print marketing offers targeting that we could call “profile-based”. For instance, readers of a magazine called “Photography” or “Fit Nation”, buy these because they are interested in those respective topics. They are so interested that they are even ready to pay to read about it! So if you have a shop that sells cameras, or if you operate a gym, slipping a flyer or leaflet into that magazine could have some very beneficial effects for your business. In the same vein, if you have identified that the buyer persona for your company’s business is a bank or insurance company employee, then you would be smart to distribute your flyers around bank or insurance company buildings, or hang posters in the elevators of their buildings. This kind of targeting is not always possible online. While online advertising, and especially online display advertising is considered by many as quite spammy and intrusive, print advertisement provokes people to read and study it, if properly designed. Print is often considered as boring, but it can actually be a lot of fun when you put your creative mind to it. It is also used less often these days, so an original print ad will stand out and be remembered more (source). A lot of the criticism that is directed at print marketing, is that its return is more difficult to measure than is the case with online marketing (for which returns are very easily measured). Although it is true that it might be complicated to accurately measure the impact of a print ad on long-term elements such as brand image, brand recall, and brand loyalty, a couple of simple tools can be used to directly measure the efficiency of your print ad in terms of customer acquisition and customer lifetime value. To achieve this, you can easily integrate QR codes in your prints that redirect people to specific specific URLs (a process called UTM-tagging) or vanity sites set up specifically for tracking this channel’s performance. In addition, you can include hashtags, your Twitter account, as well as your Facebook account (to mention but a few) on your prints to create synergies with your social media presence. If your traditional ad is entertaining enough, people are very likely to visit your social media page and engage with it. It is argued that combining both print marketing and online marketing yields the highest levels of ROI for businesses, which explains why a majority of companies relies on this strategy. Speaking of strategy, it is crucial that you develop a marketing strategy that is not only consistent across all channels, but also complimentary. However, a marketing strategy lecture is not on today’s program. Maybe later. Let me end this (rather long) post with an important example of print marketing that is very beneficial to a lot of e-commerce websites: brochures/catalogs. Catalogs represent a convenient and engaging medium for people to browse through a company’s offering, and mark what they are interested in, before ordering it online. It is way more pleasant (and better on the eyes) to spend 30 minutes browsing Ikea’s latest catalog rather than spending that time doing the same on your computer. I am not saying that every company needs to create a 100-page catalog to show off all the products that it sells, but an overview of your best-sellers can attract many more people to your website by whetting their appetite. In the end, it is up to each one of you to design your marketing strategy as you please. The main point of this article is just this: don’t discard print advertising straight away because you believe that it is boring, useless, or hard to measure the ROI of. These points are absolutely invalid.> If you agree or disagree, please feel free to comment and share your thoughts. And don’t forget: if you decide to print some flyers, posters, or anything else to strengthen your offline marketing, make sure that you do so with Gogoprint!